John Hope was born in 1940 in Oregon. He enlisted in the U.S. Air Force on September 3, 1958, and after going through basic training, he completed technical training as an Aircraft Electronic Navigation Equipment Repairman at Keesler AFB, Mississippi, in August 1959. His first assignment was as a B-52 Stratofortress and KC-135 Stratotanker electronic navigation system repairman with the 4126th Avionics and Armament Squadron at Beale AFB, California, from August 1959 to June 1960. Amn Hope was then accepted into the Aviation Cadet Program for Navigator Training, and was commissioned a 2d Lt and awarded his Navigator Wings at Harlingen AFB, Texas, on May 8, 1961. After completing Navigator Bombardier Training and B-52 Combat Crew Training, Lt Hope served as a B-52 Radar/Navigator with the 46th Bomb Squadron at Grand Forks AFB, North Dakota, from July 1963 to January 1965, followed by service as an instructor navigator with the 329th Bomb Squadron at Castle AFB, California, from January 1965 to May 1966. Capt Hope was then selected for pilot training, and was awarded his pilot wings at Reese AFB, Texas, in May 1967. His first pilot assignment was as a B-52 co-pilot with the 441st Bomb Squadron at Mather AFB, California, from September 1967 to September 1969, followed by AC-119G Shadow gunship Combat Crew Training from September to October 1969. During this time he deployed to Southeast Asia for Arc Light in 1968. Capt Hope again deployed to Southeast Asia in March 1970, serving as an AC-119 pilot with the 17th Special Operations Squadron at Phan Rang AB and Tan Son Nhut AB, South Vietnam, until January 1971. He then returned to the 441st Bomb Squadron at Mather AFB from January to March 1971, followed by service as Wing Bomber Scheduling Officer for the 320th Bomb Wing at Mather from March 1971 to October 1973, during which time he again deployed to Southeast Asia for Arc Light in 1972 and 1973. His next assignment was with the 441st Bomb Squadron and then Chief of the Command Control Division for the 320th Bomb Wing at Mather from October 1973 to May 1977. Col Hope served on the staff of Headquarters U.S. European Command in Stuttgart, West Germany, from June 1977 to December 1980, and then served as Operations Officer for the 4018th Combat Crew Training Squadron at Carswell AFB, Texas, from December 1980 to January 1983. His next assignment was as Deputy Director of Combat Plans on the staff of Headquarters Strategic Air Command and on the Joint Strategic Target Planning Staff at Offutt AFB, Nebraska, from January to August 1983, and then as Assistant Deputy Commander for Operations of the 320th Bomb Wing at Mather AFB from August 1983 to July 1984. He served as Deputy Commander for Operations of the 320th Bomb Wing from July to December 1984, and was Special Assistant to the Commander of the 320th Bomb Wing from December 1984 to May 1985. His final assignment was as Chief of the Nuclear Warfare Status Branch in the Organization of the Joint Chiefs of Staff at the Pentagon from June 1985 until his retirement from the Air Force on November 1, 1988. 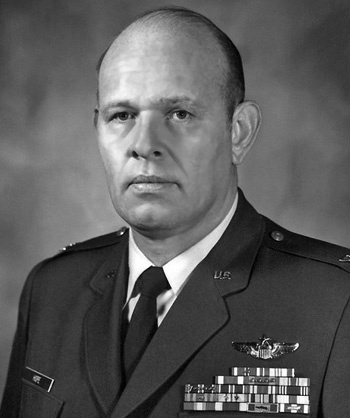 Captain John L. Hope distinguished himself by extraordinary achievement while participating in aerial flight as an AC-119G Aircraft Commander at the Dak Seong Special Forces camp, Kontum Province, Republic of Vietnam, on the night of 12 April 1970. On that date while flying an armed reconnaissance mission, Captain Hope was directly responsible for preventing a besieged friendly outpost from being overrun, by a large hostile force. Despite great personal danger from intense small arms and antiaircraft fire Captain Hope directed his aircraft's fire power against the hostile forces inflicting heavy casualties and halting the attack. The professional competence, aerial skill, and devotion to duty displayed by Captain Hope reflect great credit upon himself and the United States Air Force.